The Shape & Texture of Names project started in a course on Citizenship within the MA Visual Sociology program at Goldsmiths. I used forenames as a lens to investigate citizenship, identity and power. In particular, I wanted to better understand the names we use in our everyday lives, what names tells us about one’s belonging to a space, and how this belonging is socially constructed. The investigation emerged from conversations around when people use certain names socially. For some, their name-use was strategic; they were conscious of their actions to compartmentalize (to use one name at work and another name among close friends, for instance) or establish a system. “The self is reflexive in that it can take itself as an object and can categorize, classify, or name itself in particular ways in relation to other social categories or classifications” (Stets and Burke, 2000, p. 224). Name-use, however, is not simply a process of self-categorization or self-identification without social forces at play encouraging these decisions. We see many examples in the world of individual use of names as strategies for privacy protection, non-normative social participation, freedom of speech/action, etc. As names are often taken-for-granted requirements for identification and participation in many daily activities, the name can also be the site of everyday protest through personal strategies of identification, pseudonymity and anonymity. Building on the work of Foucault, Hall and Butler, through this project I wanted to investigate identification as an ongoing, fluid process via one’s multiple use of forenames. To capture naming data, I distributed a survey through social media and collected name data from over fifty participants (not an representative sample, I know, but I used this as a starting point to play with data, then later redesign and redistribute). The survey asked individuals to list eight names they use or are known as. It then asked them how many people know those names and how often they use those names in various contexts (at work, among family, among friends, on official documentation, and online). As we can see, one’s way of identifying changes in various spaces. The contours may become more or less defined from space to space. 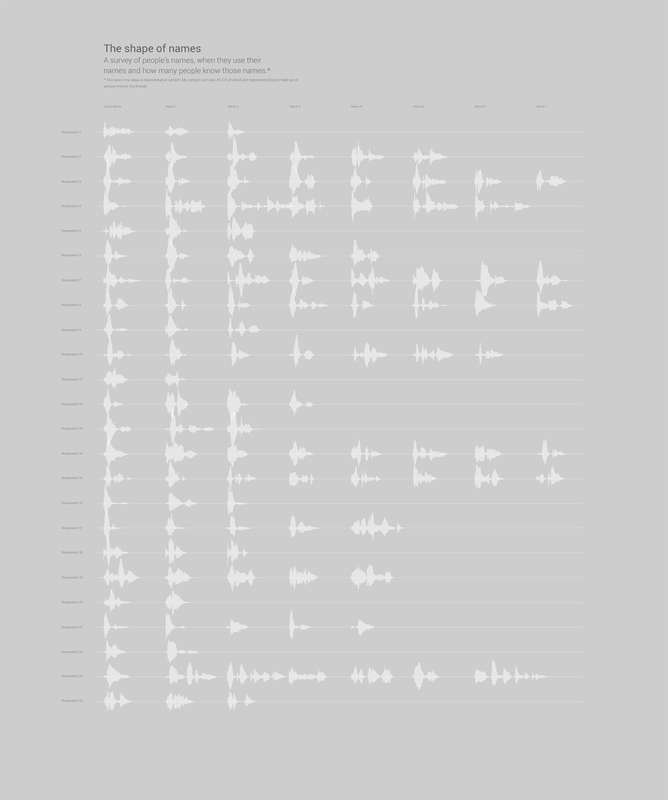 Visualizing names as sound wave forms opens opportunities for anonymity without pseudonyms, while maintaining a quality of the original form. The data above explore frequency, a measure of time. Thus, it felt more appropriate to use sound to represent frequency of name use. Sensory methods provide opportunities for capturing the fleeting and temporal elements of data (Ruppert, 2015). Following the visualization of name data, it became apparent that in placing names in a fixed state, the visualization supported theoretical approaches to identities that see identity as singular and fixed over time. For this reason, I considered how I might use audio to capture and communicate Butler’s notion of the identity as a process. My first test used data from frequency of name use among friends to hear it’s identification soundscape. “Thinking with our ears directs us to the temporal aspect of social life” (Bull and Back, 2003). In reverse, using sound encourages us to reorient towards temporality and qualities not easily expressed in words or conventional representations of data (graphs, charts). My second test used data from frequency of name use overall, at work and in official documentation to hear their identification soundscapes. Despite a fluid, complex texture of sound across all spaces, among friends and even faintly at work, the official sphere is almost entirely a singular tone with an occasional blip in the background (is this an individual protesting the state’s singular approach to identity construction or is this an error on the part of the individual to have one legal name?). If our identification with the state were more complex and fluid, would we continue to believe in the existence of (and put our trust in) the concept of a “real name”? I will be posting more about the project’s process and themes, as well as the outcomes of next experiments. As this is just the start, please comment and feedback! Bull, M. and Back, L., 2003. Auditory Culture Reader. Oxford: Berg Publishers. Hall, S., 2000. Who Needs ‘Identity’? In: du Gay, P., Evans, J. and Redman, P (eds. ), Identity: a Reader. Sage Publications Inc., 15-30. Stets, J.E. and Burke, P.J., 2000. Identity Theory and Social Identity Theory. Social Psychology Quarterly [online], 63 (3), 224-237.